This is the 250th edition of the Epileptic Gibbon podcast music show and the playlist to accompany it. You may be able to CLICK HERE TO DOWNLOAD but note the shows are large files & this may not be the best way to listen. The show is also available to stream via Mixcloud and the Progzilla Radio Network (the show appears on Progzilla in alternate weeks). Your regular host is currently occupied with work, so Daniel Staniforth and Rebsie Fairholm are kindly sitting in again to present one of their takes on Eppy Gibbon music. The feature album is ‘The Chopin Project’ by Ólafur Arnalds & Alice Sara Ott, so you’ll hear three tracks from that. Other than that you can expect the usual eclectic mixture of styles and genres. Below you’ll find the track list, plus weblinks from where you can find more information about each artist. Total running time: 2 hours and 15 minutes. Downloaded file is 123 MB. Thanks to all the musicians who contributed and to all listeners. Send us comments if you like what you hear (or even if you don’t… feedback is so important!). If you want to keep up to date with news about the show, EppyFest, or just chat with other listeners, don’t forget that there’s a Facebook group – just search for the Eppy Gibbon Podcast Show on Facebook and request to join, plus don’t forget that we’re now part of the Progzilla Radio Network. 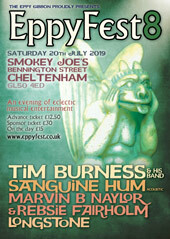 Eppy will be back next time with lots of great music and the usual eclectic mixture of styles and genres. Specifically he’ll be starting his countdown of his favourite 30 albums from 2018, counting down the albums from 30 to 21, so we hope you’ll be back for that.